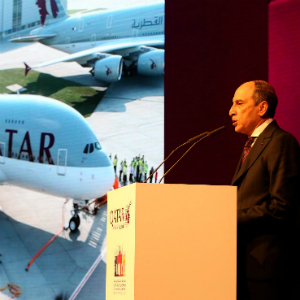 DOHA, Qatar, 2018-Sep-10 — /Travel PR News/ — Qatar Airways is proud to participate in the Qatar-Germany Business and Investment Forum, the ninth edition of the premier economic event, which took place in Berlin yesterday, under the patronage of His Highness The Emir of the State of Qatar, Sheikh Tamim bin Hamad Al Thani, and in the presence of Chancellor of Germany, Ms. Angela Merkel, and the Deputy to the President of Germany and Governing Mayor of Berlin, Mr. Michael Müller. Qatar Airways Cargo, one of the world’s leading international air cargo carriers, serves more than 60 freighter destinations worldwide via its world-class Doha hub and also delivers freight to more than 150 key business and leisure destinations globally on more than 200 aircraft. The Qatar Airways Cargo fleet includes two Boeing 747-8 freighters, 13 Boeing 777 freighters and eight Airbus A330 freighters. This entry was posted in Airlines, Business, Festivals and Events, Travel, Travelers and tagged Business, Dr. Eric Schweitzer, Dr. Mohammed bin Saleh Al Sada, Germany, Investment Forum, Mr. Akbar Al Baker, Mr. Ali Shareef Al Emadi, Mr. Andreas Scheuer, Mr. Jassim bin Saif Al Sulaiti, Mr. Michael Müller, Mr. Mohammed bin Abdullah Al Rumaihi, Ms. Angela Merkel, Qatar, Qatar Airways, Sheikh Ahmed bin Jassim Al Thani, Sheikh Tamim bin Hamad Al Thani. Bookmark the permalink.